In 1935 John Pascoe named this peak ' The Great Unknown because it was a 'cornerpost in a welter of new country'. From the Perth, The Great Unknown offers a great multi-day trip in its own right, while it is sometimes used as a transalpine route to and from the Garden of Eden. From Scone Creek Hut, follow the track upvalley over Scone Creek bridge then cross the Perth bridge to the true right. Follow the riverbank and vestiges of the old FS track up to Redfield Creek. Begin up the creek, but it will be necessary to sidle past several falls, particularly above about the 800m contour. Both the stream above here and an alternative using the spur out to the true left have been used. You choose. Climb up the ridge towards pt 1684m. From this ridge there are two more alternatives. The first route sidles steep tussock from upper Redfield Creek at about the 1200m to 1300m contour across to another spur coming off pt 1684m bordering Elizabeth Stream and descends to flats in that stream at 1200m. There is good camping here. Cross Elizabeth Stream and ascend the spur on the true right where there are also campsites, with tarns, at about the 1500m contour. Continue towards pt 1898m, crossing to the north side of the ridge at about the 1800m contour and bypassing pt 1898m itself which is a bit gnarly. Sidle under pt 2024m across shingle, easy rock slabs and snow onto what's left of the Adverse Glacier, which isnt much. 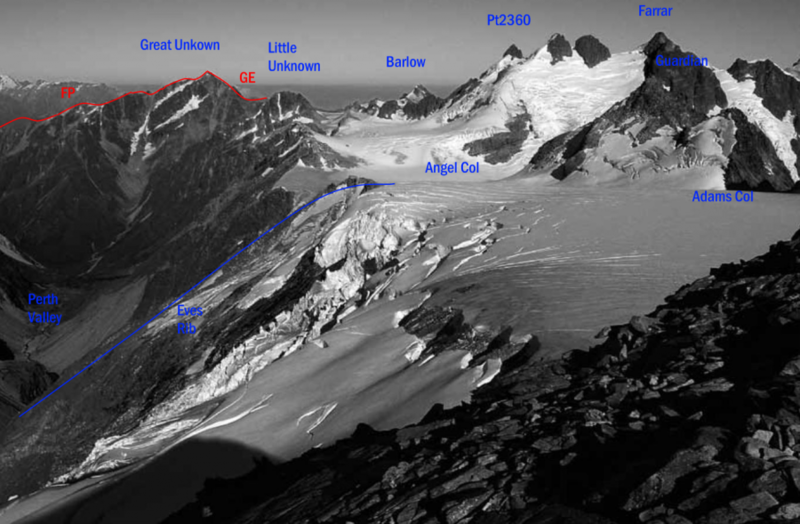 The second route sidles a little to the west of pt 1684m on a shelf between 1500m and 1600m before climbing through basins for a kilometre to reach the ridge between pt 1926m and pt 2024m. Continue over to the Adverse Glacier. Snowslopes and easy rock, including slabs, then lead to the summit of Great Unknown. Some have had crevasse problems on the Adverse, but normally there should be no problem. To continue to the Garden of Eden, go a short distance to the north west along a rock rib from the summit of Great Unknown and descend north north east towards a basin at the 1800m contour. Sidle at more or less this height through to the Gardens. Time: One very big day from the Gardens to Scone Hut. Allow 2 going up. Approached from the Perth using a mostly gravel slip stream beginning at I35 105583. This route utilised a cage across the Perth above the Barlow confluence, but the cage has long gone. Paul Powell, A H (Bonk) Scotney, Jim Croxton, 27 Dec 1939. From the Garden of Eden, sidle at roughly the 1760m contour on the north side of the ridge to a basin at 1800m. Head south, up a basin of rock and snow to reach the west ridge just before the summit. A scramble. Variations exist closer to the ridge, with more rock climbing involved. John Gabites, John Rogers, Alan Brown, 29 Dec 1939.